October 26, 2016 E-mail this page to a friend! Point Piper and Mario Gutierrez in the winner's circle after the Longacres Mile at Emerald Downs on August 14. 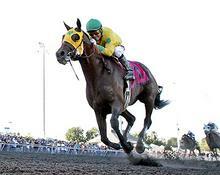 It looks like Emerald Downs will have a rooting interest in the 20016 Breeders’ Cup at Santa Anita. Longacres Mile champion Point Piper is has been pre-entered in the $1,000,000 Breeders’ Cup Dirt Mile on Friday, November 4. The 6-year-old son of Giant’s Causeway is among 12 runners pre-entered in the Dirt Mile, a list including four 3-year-olds led by Kentucky Derby third-place finisher Gun Runner. Jerry Hollendorfer, trainer of Point Piper, also sends out undefeated Songbird to face Beholder and Stellar Wind in Friday’s main event—the $2,000,000 Breeders’ Cup Distaff at 1-1/8 miles. Point Piper has raced only once since The Mile, finishing fourth in the Kelso Handicap (G2) at Belmont Park, but continues to train steadily at Santa Anita, and four of his five career victories are at a mile, including his explosive track and state record 1:32.90 at Emerald Downs. Dortmund, who was nominated and high-weighted at 126 lbs for the Longacres Mile, has apparently seen enough of California Chrome and will bypass the Breeders’ Cup Classic and also opt for the Dirt Mile, according to trainer Bob Baffert. Runhappy, winner of the 2015 Breeders’ Cup Sprint, also is being pointed to the Dirt Mile.